Formally, and without employing their usual shock-tactics, PETA penned a letter to fashion design students at Central Saint Martins, countersigned by eight fur-free designers. Most of whom are fresh out of Granary Square themselves, and all crowned masters of compassionate fashion. We talk to the director of PETA, Elisa Allen, on why CSM’s fashion design students were the best people to approach, and how rescuing her first cat meant empathy was unavoidable. PETA’s relationship with the fashion industry has long been deemed a tasteful one, as campaigns fronted by Naomi Campbell and Cindy Crawford painted animal activism in a way that consciously avoided clipboards and fleece coats seen up and down the highstreet. Nowadays, their work has meant that a fur-free status is synonymous with the fashion establishment, with i-D reporting that “86% of London Fashion Week designers did not use any fur in the A/W ’16 catwalks” joining the adamantly cruelty-free brands Stella McCartney and Vivienne Westwood. With the well-known already won over, it would seem sensible that the future of fashion should be made aware of the harm that comes with dancing with the devil, a strength that is difficult to muster when a hard up design student is offered sponsorship to fund their final year fashion collection. An experience all too familiar to Elisa, a student herself not so long ago, “I know how tempting anything free can be – but that’s no excuse to sell out”. Her advice is as particular to students at a certain university as the letter written to them, “I’d urge talented students at Central Saint Martins to look into the Stella McCartney scholarship which supports progressive, sustainable and compassionate design”. It’s clear that PETA is still looking to involve the fashion establishment, if only a few years prematurely, but the seriousness of this campaign is shown not in shocking imagery but, instead, the collective attention of designers who have followed the education system and woven success out of their morals; chiming as a collective “it’s easy to produce a killer look that no one had to die for”; advising on the best plan of action while championing that students have “a unique opportunity to influence the next generation of consumers by embracing the trend towards cruelty-free fashion”. From reading the letter, it is clear to see that PETA and the associate designers are riding on the wave that has (quite recently) seen veganism transported from a choice with limiting connotations, to a lifestyle that has become a fashionable status symbol among many. The letter continues, “the dying fur industry is desperately trying to keep itself visible by pushing pelts on up-and-coming designers. We, the undersigned, urge you not to give in to industry bribes and incentives”. It’s clear from the offset who sits on which side of the students’ shoulders. 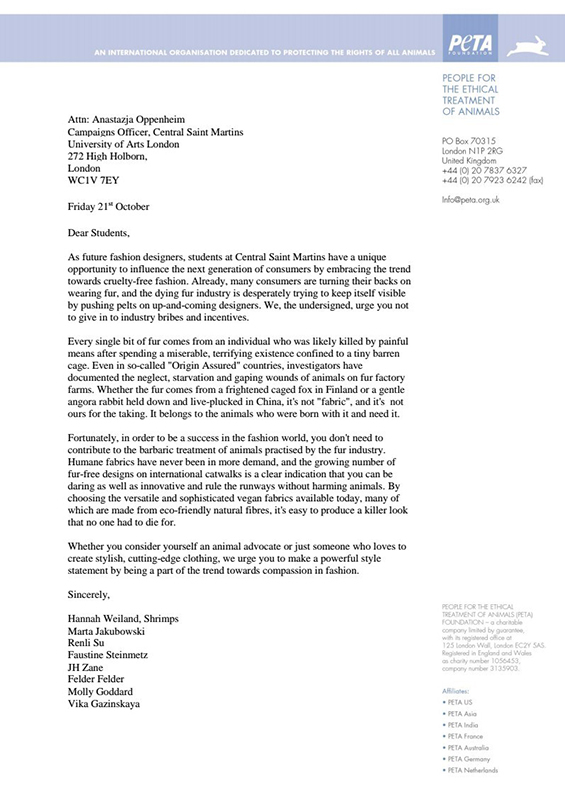 Letter written by PETA to fashion design students at Central Saint Martins, countersigned by eight fur-free designers. Aside from doing their job down to the letter, the designers who lend their signatures in support have entered the fashion zeitgeist recently, of their own accord. As Molly Goddard opens her first interactive exhibition (on at the NOW Gallery, Greenwich, until January), Faustine Steinmetz, whose work pulls denim back from clutches of patches ironed onto a dungarees, replenishes the old faithful fabric with pieces like her hand dyed yarn jeans, (think, silky strands of woven fringe, oodles of movement, begging for a knees up). We like our denim like we like our cats: very important, if a little high maintenance. Not just an inside affair reserved for the former worker bees of CSM, other designers include Hannah Weiland, Marta Jakubowski, Felder Felder, Renli Su, JH Zane and Vika Gazinskaya, all of whom make up quite a strong pack as representatives of varying styles, cultures and degree courses (important when trying to appeal to the varied landscape that is the creative student body in London). When news of the letter was released, Hannah Weiland felt like the obvious partner to PETA; her brand Shrimps has untangled the stalemate that had previously left faux fur straddling between real fur’s bad reputation, and the matted renditions of leopard print overlooked on eBay the world over. With her new arrivals such as the “Claude”, “Coco” or “Chantal”, man-made fur is no longer being fronted by barmaids on EastEnders, but rather the feast of kitsch, cool and tongue in cheek chic that each name suggests. In our interview this week, the current Director of PETA, Elisa, beamed that Weiland’s designs feel all the more luxurious because they “prove that today’s ‘must have’ pieces do not support one iota of cruelty”, tying in quite neatly with their “Fake for Animals’ Sake” campaign that aims to sell enamel pins securing the status of your fur as fake. Once asked if the recreation of the texture of fur still represents the pelt of an animal once living, Elisa is firm in her retort, quick to explain that “real fur has fallen so far from favour that the fur industry has resorted to camouflaging it with bright dyes and patterns”, replicating the overt artificiality that fake fur has cemented as a way to oppose the fur industry. Imitation seems to be the last bastion of selling power to be generated, a modern war cry that is far from the seal of authenticity once marked by animal heads, tails and limbs being left on fur stoles in the 1930s. This mark of an animal captured by human hands was a way of matching the characteristics of the animal to a wearer, with a piece written in American Vogue (1929) preying upon the concept of a wearer’s association with “aristocratic animals”, continuing that those wanting to be deemed fashionable should have “beautiful furs – whatever sacrifices it may take to get them”. Rectifying this in 1990 with their “I’d Rather Go Naked Than Wear Fur” campaign, PETA’s power to change attitudes towards fur still seems rather modern; “Decades ago, many people didn’t know about what happened on fur farms, to claim ignorance now is pretty much impossible”. Two “wonderfully quirky rescue cats”, Trudy and Oreo are the current representatives for animal empathy, sheltered firmly in Elisa’s family. “A lot of people can relate to the animals they share their homes with – so I always try to work that into various conversations”. The success of PETA’s campaigns, therefore, must lie in the moral strength of their work force as life experiences are bonded into the campaigns that strike a chord with designer and consumer alike.